In honor of Chanel’s new makeup collection, house artist and color designer Lucia Pica creates a high-definition look on actress Kristen Stewart. Blushing can be a nuisance, particularly when your current flame takes notice. But that rosy complexion (also a side effect of brisk morning jogs or restorative soaks in a bathtub) also caught the attention of, and ultimately inspired, Lucia Pica, Chanel’s impossibly cool global creative designer for makeup and color (she wears a black patent leather skirt as comfortably as a pair of jeans). “Red is a color that your face naturally produces, but for this collection I subverted it a little bit,” explains Pica of Le Rouge Collection N°1, an 11-piece makeup line that includes blush, velvet-matte eyeshadow (a new texture for Chanel), and even eyeliner in bewitching and surprisingly wearable shades of crimson. “You use red on your lips, but you can also put it on your eyes or wear it as a blusher,” she adds. To prove her point, the Italian-born artist, whose expert skill was honed under the tutelage of Charlotte Tilbury and who is frequently showcased on magazine covers (Vogue Paris, Vogue UK, Another Magazine), artistically executes an impactful, all-red look on actress and Chanel muse Kristen Stewart. “When I was working on the campaign with Kristen, she told me that actors sometimes apply red eyeliner to make their eyes appear more intense,” Pica notes, referring to Eros, the universally complementary burgundy-brown eyeliner. “But don’t forget to have fun; mix and blend the shades, get playful.” Read on below for Pica’s tips for how to play with the shade on your visage. Dress up the eyes with Les 4 Ombres Candeur et Expérience by blending the top left shade in the palette with the brick red shadow and the bottom right shade. Apply the mixture over the entire eyelid and along the crease using the Chanel Large Eyeshadow Brush N°25. To further accentuate the eyes, draw a thin line of Stylo Yeux Waterproof in Agapé above the upper row of lashes and Stylo Yeux Waterproof in Eros along the lower lashline. Add an application of Le Volume de Chanel mascara in Noir to the upper lashes to intensify the look. Line the contour of the lips with Le Crayon Lèvres in Rouge Profond, following with an application of Rouge Allure Velvet in Rouge Charnel with the Retractable Lip Brush. Pica’s recent appointment at Chanel is the culmination of more than a decade’s worth of experience in the industry. Upon moving from her birthplace in Naples, Italy, to London in the 1990s, she started her career in theater makeup. Her interests, however, detoured away from the stage toward a more editorial direction with a position as first assistant to the incomparable Charlotte Tilbury. Since becoming an established artist in her own right in 2008, Pica has been steadily building a notable portfolio, including collaborations with photographers such as Alasdair McLellan, Juergen Teller, Mario Testino, and Sølve Sundsbø. Browse the collection of Chanel products currently approved by The Violet Code. 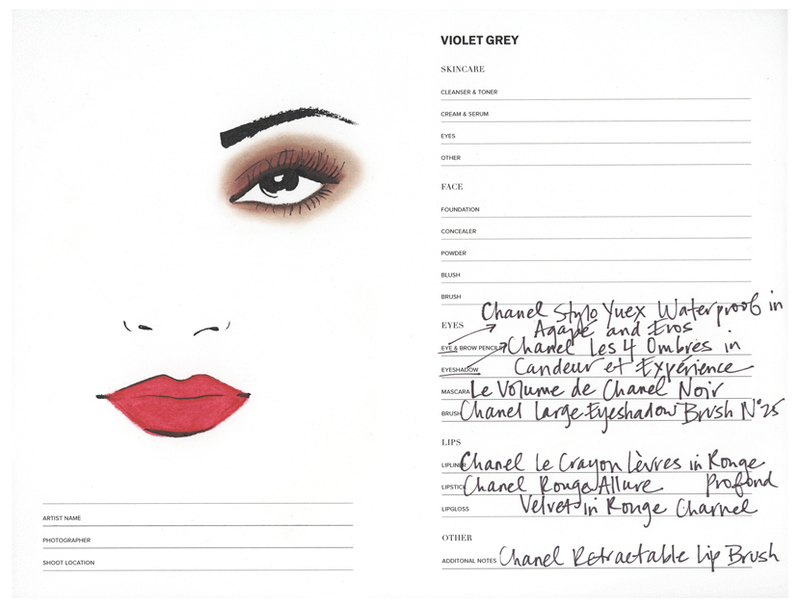 Makeup artist Kate Lee shares her secrets on how to execute an artfully drawn eye look.